What costs $1.4 million, looks vaguely aeronautical, and it's been in the rumor mill since last month? You are correct, sir. 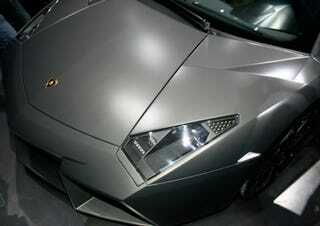 It's the Lamborghini Reventón, introduced by Lambo boss, the ever dapper Stephan Winkelmann. As we reported recently, it's based on the LP640, but as we didn't report, it's named after the bull that killed famed toreador Felix Guzman in 1943 (Wrecked Exotics call the front desk.) Still, ever since Lambo's parent built a far more mad machine for a loss at $1.4 million, we're kind of jaded in that price range. A four-fold-priced bespoke Murcielago with a jet fighter dash is neat, but is it mad enough? Clearly a Lamborghini, but nothing quite like it. A super car without equals: the Lamborghini Reventón is a road vehicle with an extreme specification and, at the same time, a limited edition masterpiece - a coherent style, angular with sharp lines, inspired by the very latest aeronautics. The front is characterised by the acute angle of the central 'arrow' and by the powerful forward-facing air intakes. Although they do not supply air directly to the turbine like an airplane, bearing in mind the 650 hp, an abundant volume of air is necessary to cool the carbon brake disks and the six cylinder callipers. Naturally, both doors on the Reventón open upwards - since the legendary Countach this has also been a symbol of the V12 Lamborghini product line. With their asymmetric configuration, the large air intakes below the doors provide an example of the extreme coherence with which a Lamborghini fulfils its function: on the driver's side it is large to increase the flow of oil to the radiator. On the passenger's side of the vehicle, the air intake is flat because in this case, it only has to ensure the flow below the floor. The aerodynamically optimised flat floor structure terminates at the rear with a diffuser featuring an accentuated shape. This guarantees excellent road grip and stability even at 340 km per hour. In spite of the extreme and innovative language of its shape, the Reventón not only maintains all the strong features of the Murciélago LP640, but also offers further amelioration in terms of aerodynamics, the important engine cooling system, the air intake system and brakes. The airflow and the section of the variable geometry air intakes of the engine and the rear spoiler (also adjustable) have been modified.